Please Note: Reloading data is provided by our contributers. We accept no responsibility for ANY of the provided data and all reloading is done entierly at your own risk. I am in need of 410(36 guage) 2 inch ammo.Thanks,please let me know. 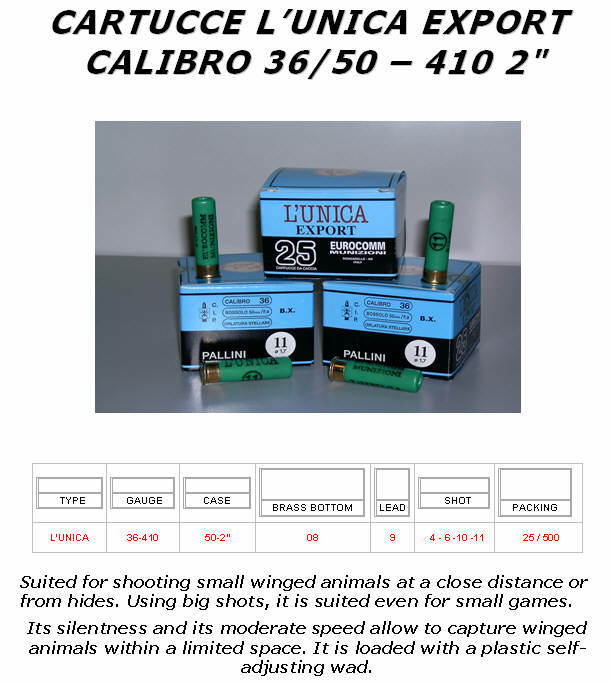 See the L'Unica 2" shells below aswell .. Looking for a reloading recipe for .410 "light and quiet" for dispatching pests, and not trouble the neighbors. If you are a reloader, already, this will work well for up to 25 feet. First, aqquire some 2 1/2 " remington shells, and cut them to 1.5". a razor blade, and some patience will do well. Next, I use a mec loader, so I de-prime/resize, then re-prime w/ a 209 winchester . Next, fill with 12 grains of 2400 alliant/2400 powder. The next step is what does so well. You will need some 44 magnum shotshell capsules from "speer" after they are charged with your preferred shot (8-9 best) simply manually insert into the .410 hull. You are done. You can reduce loads if you want, however these work well, no recoil, some noise, but not even like the "full load" 2 1/2's. I experimented with old, burned off .410 shells one day, and came up with this. This is what I’ve found out from other sites it is untried but I'm in the process of trying it out. When loading brass cases for use in the .410 bore shotgun, pistol primers should be used. It all has to do with the pressure generated by the loads and the designed impact of the firing pin: pistol primers are designed to ignite with only 6 to 9 pounds of impact, and resist pressures only half that of rifle primers. Card wads are needed over the powder and the shot column, and felt wads are needed over the powder wad. These wads can be cut from thick felt or solid cardstock using a home made punch. A 300 H & H case can be sized in a .44 Special seater die deep enough to create about 3/8" of straight wall on the side of the case. Cut the case at the top of the straight section, then again just above the solid web at the base of the case. Sharpen the outside of the case mouth with a deburring tool, leaving the inside edge straight. Card stock is then placed on a relatively soft but flat surface, like a piece of truck inner tube on a kitchen cutting board, to protect the cutting edge of the home made wad cutter. Use a rubber hammer on the top of the card cutter, and disks of the correct diameter will be cut perfectly. The card wads should be left "dry," but felt undershot wads should be lubricated to reduce leading in the barrel. There are nice commercial products available for this, or you can soak the felt wads in a 50-50 mix of melted beeswax and Vaseline, then let them cool and dry on paper. Wad pressure is a controversial subject. Of more importance is seating resistance, where the top wad is sealed firmly enough to enhance pressure buildup before releasing. The old way, when all brass cases were the norm, was to put 8 to 10 drops of waterglass (also called "egg keep") on the top wad. In an emergency, use what you have, such as Elmer's glue, and clean the barrel more often. Good Luck Shaun G.
I thought you would like to know that magtech (http://www.magtechammunition.com/store/p14details556.php) are now producing new brass cases for the .410" / 20bore / 12 bore in 2.5" length and use pistol primers . these appear to be very reasonable in price in the usa ie 14$ for a box of 25 but god knows what the shipping will be. As a boy growing up in the eastern United States I was limited by law to hunting with a shotgun. Rifles were prohibited and I even had to hunt deer with a 12 gauge shotgun loaded with buckshot. I longed for the day I would become old enough to hunt out West with high velocity long range rifles, but for the time being I had to make do. My nemisis was ground hogs (or woodchucks). They made wonderful targets out in the fields and along the railroad tracks, but I could never get close enough to bring them down with a shotgun. I owned a break open, single shot .410 and a 12 gauge shotgun. I didn't shoot the .410 much because ammo was expensive but I found a box of .410 rifled slugs in a hardware store and decided to make a "rifle" out of my .410. My .410 had a small notch on the top of the receiver which served as a rear sight and had the standard round front sight. I knew where the ground hogs lived and could sneak up on them until they got nervous and stood up, then fire a slug at them. That was some 50 years ago and I can't remember if I ever hit any but I sure scared a lot of them. In the 1960s I was working in Missouri where there were lots of grasshoppers in the fields. I reasoned that "hunting" grasshoppers would be great sport, but the only reasonable choices for a firearm were a .22 with birdshot or a .410 shotgun. I didn't have a smoothbore .22, but by then I had a Stevens .410 double barrel with 3" chambers. I soon learned that even the short 2 ½" shells were pricey (especially for " 'hopper hunting") and a bit overpowered. I decided I needed a special 'hopper load for my .410 with some real fine shot. I am a reloader and have accumulated all kinds of dies and reloading tools. I found that 44 Special, 44 Magnum, 44-40 and .444 Marlin cases all chamber in a .410. 45 Colt cases wouldn't go all the way into the chamber. I decided to use 44 magnum cases and bought some oversize cardboard .410 wads (made for brass .410 cases which I have never found). Using large pistol primers, I loaded 5 grains of Bullseye under the wad. I filled the rest of the case with #12 shot (that's what they use in .22 birdshot loads) and put a thin cardboard wad over the top, then sealed it with Elmers glue thinned with enough water to make it run. It didn't take long to burn up 100 rounds of my 'hopper loads. Light report, no recoil and on the few occasions I connected on a grasshopper - well they just disappeared in a puff of debris. A few unfortunate bumble bees also fell prey to my .410. The only problems I had were that the .44 mag cases were a little undersized and swelled up in the oversized .410 chamber. The rims were also smaller than the 410s and had a tendency to slip over the extractor and jam things up. I next tried .444 Marlin cases. These are 2 3/16" long, the same length as a crimped 2 ½" .410 shell. I loaded these with 14.0 grains of 2400 powder, the same oversized wads and about ½ ounce of #9 shot. I had the equivalent of a 2 ½" field load that cost only pennies to load. The shells swell a bit and I run them through a .444 resizing die every third reload or so, but they work great. I use large pistol primers in these cases also. My friend's 5 year old received a small cut down .410 for his birthday and wanted to shoot it. I let him finish up some of the old .44 mag loads I had on hand and he loved them. Mostly pointed it at trees and shot leaves, but for him it was real shooting! But the same problem with the cases slipping over the extractor was still there. He tried one of the .444 Marlin loads, but complained it "kicked" too much. I revisited the 45 Colt cases and noted that they would chamber about half way, then get tight. I found that the 45ACP is a slightly smaller diameter case than the 45 Colt, so I resized a few in my 45ACP die and found they fit the .410 perfectly plus the larger rim doesn't slip over the extractor. My next load for little Jimmy will be the same as in .44 mag cases, but in the 45 Colt cases, with a little more shot as the case capacity is slightly larger. My .410 shotguns get a lot more use with these inexpensive loads. I haven't found the equivalent of a 3" load yet, but some plastic shot capsules loaded in the .444 Marlin cases should work. I must include this warning!! These loads are experimental and not recommended for all .410 shotguns, especially older models which may have excess headspace. I don't have the means to measure chamber pressures but pressures appear to be nominal as the shot charge is fluid and doesn't offer much resistance in the barrel. Also, the cardboard wads do not seal the burning powder perfectly and I am sure there is some blow-by which keeps the pressures lower than with a plastic wad. However, if you want perfection buy commercial ammo! !